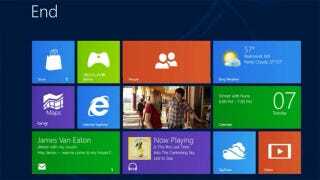 As part of its Windows 8 Consumer Preview, Microsoft has been releasing a small selection of apps for testing. One, called People, seems particularly interesting, acting as an OS-wide social and contact tool that integrates with Facebook, Twitter and Google, amongst others. The cloud-based app is designed to keep contacts in order, sure, by syncing details from a glut of online address books. But it also lets users view and interact directly with their Facebook and Twitter accounts, retweeting posts or liking statuses, from within the app itself. The app is also designed to sync data from Exchange, Google and LinkedIn, and has a built-in conflict management system—a little like Windows Phone—which attempts to collate contact data.